This is a scheduled post. I am out of town, until 5/1. 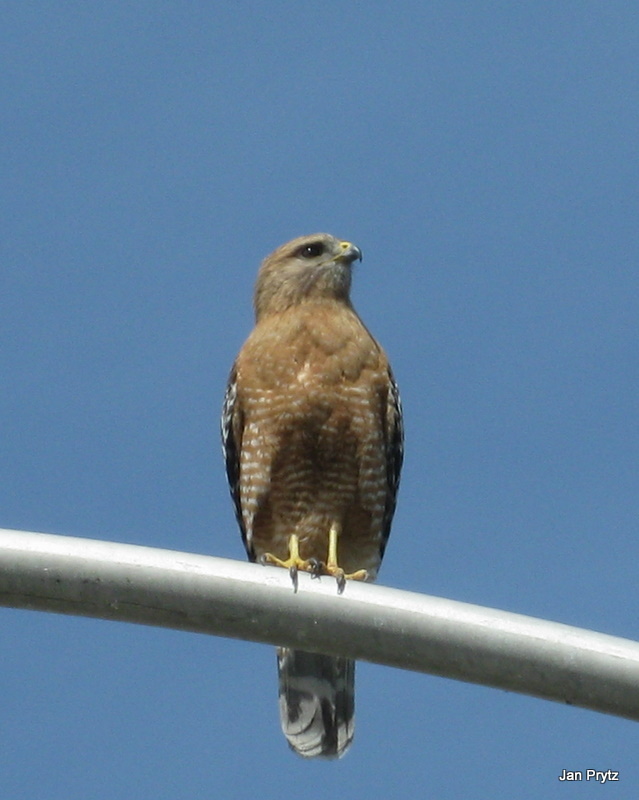 Hawk on a lamppost. I snapped this and he flew away! I love the strength and confidence that they carry. Nice shot, Jan!! Great shot Jan...hope u n Bob are having a blast on your cruise! Great shot... I often see the sparrowhawk in our silver birch and never succeed in getting a photo of him before he flies away. Wow, on a cruise! Hope you are having a super time. And that hawk is magnificent. You were there with the lens you needed and voila! By the way, these new thumbnails seem a bit hard to see. Maybe we could go back to the size you had last week? He's beautiful! So majestic looking. Have a great day! So glad he waited for you Jan. Goos catch. I hope your having a wonderful trip. I just learned how to use the linky. It's fun to find so many other blogs full of photos, thanks for creating this space to share. I'm glad he waited an posed for you...I hope you're having a wonderful time on your cruise.